Yard Shunter is a DCC operated BR goods yard layout, based in the BR (Southern) region between 1948 and late 1950's somewhere in Devon during these years. 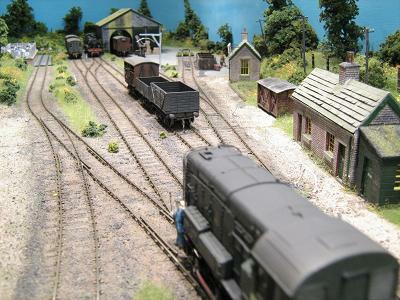 A small goods yard with a private timber merchants siding has been modelled in a relatively small space, but includes a goods shed, coal merchants and a cattle pen, a run round for shunting the private siding. To exit the scenic area through the bridge to the fiddle yard, representing the entrance of the goods yard from the station beyond the bridge. Operation is DCC, there is currently a Class 08 shunter with sound, and an N class loco and a standard tank class 4MT 2-6-4, rolling stock will be expanded in the future. All track is C&L Finescale hand built with wooden sleepers, ballasted and then rails painted represent the track that would be seen at a goods yard. 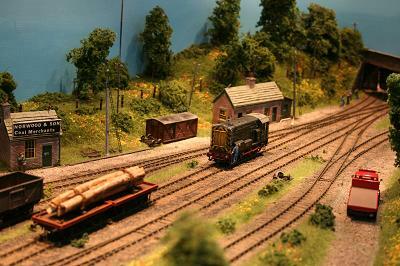 The major buildings are scratchbuilt, but some buildings are kits. 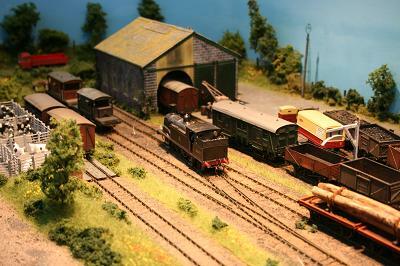 The majority of the details are kits (plastic, whitemetal and etched-brass) and all have been painted and weathered. DCC uses a NCE PowerCab, with the points operated by servos also being DCC operated via an MERG servo 4 and accessory decoder. The locomotives are of Bachmann, (N class and a standard tank 4MT 2-6-4, diesel class 08) and represent those classes that would have been seen in Devon. The class 08 shunter has been weathered.